Click on image for the Annual Report summary. 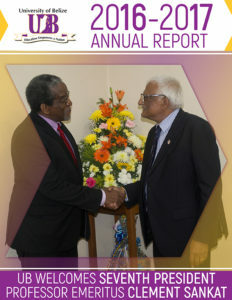 The University of Belize (UB) is pleased to announce the publication of both its 2016-2017 Annual Report and its Annual Report Summary as presented by the President of the University of Belize, Professor Emeritus Clement Sankat. The reports reflect the work of the University for the 2016-2017 academic year. It offers information about the University’s gain in teaching and learning, research and innovation and out-reach. It also highlights the University’s achievements, statistics, operations and financial performance, including the audited financial statements. For more information on the 2016-2017 Annual Report, to send your comments or to find out how you can partner with us, please contact the Office of Marketing and Communications at communications@ub.edu.bz. We hope that you’ll find the report worthwhile and useful. Please select the link below for the full 2016-2017 Annual Report https://www.ub.edu.bz/download/annual-report-2016-2017/.